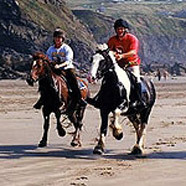 Our Association of Riding Centres, based throughout Wales, has been offering people of all ages a wonderful experience of riding & trekking in fantastic countryside for the past 60 years. Wales boasts some of the best landscapes in the world & what better way to experience mountains, valleys, beaches and woodland than on horseback. North Wales Centres This beautiful area boasts the Snowdonia mountain range with its tremendous views, as well as castles, cliffs, abundant wildlife, historic sites and quaint coastal resorts. Mid Wales Centres A trekking paradise, Mid-Wales contains open countryside, forests, rivers, hillsides, incredible views, lakes & charming villages. South Wales Centres With a stunning coastline of cliffs, beaches & sand dunes bordered by rolling hills, valleys & quaint ports, South Wales offers a scenic & inspiring riding destination. We are committed to the safety of the rider & also the well-being of the horses & ponies. All riding centres on this website have been inspected & approved to ensure your riding experience is safe as well as pleasurable. Many offer their own accommodation, or can recommend nearby places to stay. There are many different options available & you will be able to choose an hourly, half or full day ride, weekly riding packages and short breaks ........ Lessons or courses combining tuition or stable management with riding out ........B & B with your own horse. A variety of accommodation is on offer, eg, hotels, farmhouses, guesthouses, camping barns & camp sites so check with the Centre you would like to ride with as each has something special to offer. 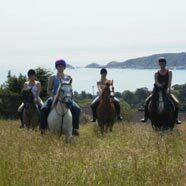 Pony Trekking: Ideal for beginners; a relaxed trip around the countryside which can last from an hour up to a day. Riding: for those who can canter & trot. Hacking: A fast pace for experienced riders. Trail Riding: Ride between overnight stops. The perfect opportunity for Mum's and Dad's (and grandparents) to take up horse riding is when the kids are at school. We offer discounted vouchers that can be used during school hours. We can tailor lessons and hacks to your level of experience and get you confident in the saddle in no time. Off Peak Vouchers are valid Monday to Friday between 10am to 3pm. Excludes bank holidays, school holidays, and inset days. 5 x 1 hr lesson/hack are £95.00 (usual price £160.00, saving £65.00). 10 x 1 hr lesson/h...ack are £190.00 (usual price £320.00, saving £130.00). Give us a call on 01792 403333 to book, or go to http://bit.ly/CFCRiding to find out more.